"A character is made by the kind of thoughts a man thinks when alone.-"Archbishop Fulton Sheen. Television made him famous. But his thoughts, while alone, in public, or before the Blessed Sacrament in Adoration, made him a man of God. 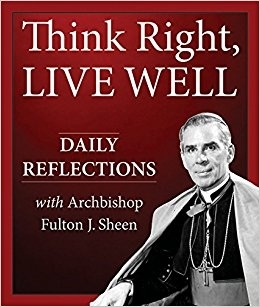 Now in Think Right, Live Well, you'll be inspired by Archbishop Sheen's words, and a one-sentence prayer to make your own. In just a couple of minutes a day you'll begin to see how Sheen's central teaching -- that shaping our minds with the truth can mean a life lived well, pleasing to God - can make a difference in your own life. Starting today.